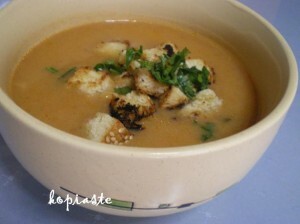 What better than a nice hot soup on a cold day like today? When Lisa from Lisa’s Kitchen and Holler from Tinned Tomatoes asked us to prepare a Vegetarian soup, to be frank I did not have a recipe. The only vegetarian soups I make are houmous chickpea soup and lentils soup and that I had blogged about them a few months ago. All the other soups I make after boiling either chicken, beef or fish and make soup in the broth. Based on a vegetable and beef soup I make, I decided to improvise by changing and adding a few ingredients and make a vegetable soup. (The vegetable-meat soup I make after boiling some beef chunks and adding a lot of vegetables which I thicken with rice). When I made this soup last week I decided to make it as a starter because I wasn’t sure if the children would like it, so it was a good opportunity to try it. Surprisingly the warm, inviting smells and the delicious taste of this simple soup must have brought back memories to them from the time when they were babies and I would make similar soups for them 🙂 or else I cannot explain how the soup disappeared in no time!! Today, I made it again but not as a starter. It was our main dish. As the soup itself would not be very filling, I decided to add small pasta to the soup. I added more water when boiling the vegetables so that there would be enough for the pasta to thicken the soup. This is my entry for No Croutons Required, hosted by Holler from Tinned Tomatoes and Lisa from Lisa’s Kitchen. Before doing anything else, wash the bell pepper and tomatoes and place them in a small roasting tin. Wet them with a few drops of olive oil and a pinch of salt and roast for 30 minutes in a preheated oven at 180 degrees centigrade. When roasted on one side turn them on the other side. Remove and place in a plastic bag for five minutes and then peel and deseed (only the pepper). In a large pot heat the olive oil and saute the onion and garlic until translucent. Add the tomatoes and pepper and saute as well. Add all the remaining vegetables and six cups of water and bring to a boil. Add salt, pepper, rosemary and bay leaf. Lower heat and simmer until the vegetables are soft, for about an hour. After ten minutes of boiling, discard the bay leaf. When the vegetables are soft remove with a slotted ladle in a bowl to cool for a while. Add the pasta, which cook for 10 – 15 minutes. Serve with croutons and paprika (and finely chopped parsley, which is optional) on top. You can find more “nistisimes syntages” (Lenter Recipes) here. When fresh, pure ingredients with no preservatives are used I think that makes it good. Thanks so much for your entry. Did you send us an email regarding your entry, because I don’t see one from you in the inbox. Glad I visited your blog, otherwise I might have missed out on your lovely soup! OMG Lisa, I forgot to send the e-mail and it’s the second time that this has happened to me. Thanks for dropping by. Shall send e-mail right away. I’m sorry Ivy, I meant to visit your blog before, but I’ve been hurrying all week! Still with my doggie problems… trying to avoid surgery I took her to a Vet that’s a bit far away and I have to take her there now and then…. anyway, I’ll let you know if the treatment finally succeeds! I like a lot the new look of your blog, it’s neat!!! I hope she gets well soon. I had read this when you posted about it in your blog but I was hoping that the treatment was successful. Yum Ivy – I have never made my own soup before, but this might be a nice place to start. Looking yummy and thanks for giving the recipe of soup with pasta.